Sometimes lane grouping signs can be confusing or they are indicated too fast to be able to react, I have turned right in more than one occasion when my intention was to go straight. In one case I rightly did it, I was not allowed to continue straight on that lane, this happened in winter time, so the road was covered on snow and by the time I noticed the traffic signs above, it was almost impossible to change to the left lane due to incoming traffic, so I turned right. Luckily I was able to turn around further ahead so I got into the right road again and arrived at my destination. 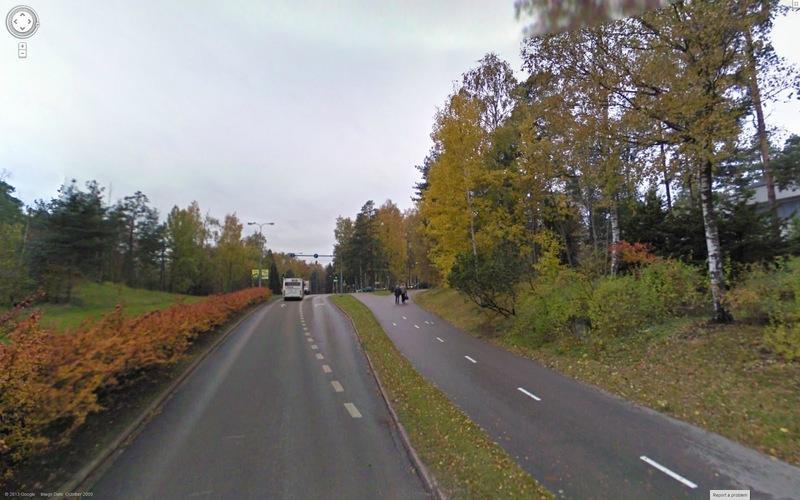 See below the picture of the location (in the summer), imagine in the winter time the road is covered by snow, so you can only see the signs above and it gets dark already in the early afternoon. I guess the main problem is that a single lane turns two without a warning and it can expand to the right or to the left. In the example above I had already avoided going to the left, that grouping was easier to notice, but further ahead the road went to a single lane again and then suddenly to two. When I am driving on an unknown location on slow speed roads, e.g. 30 or 40 km/h limits I try to drive a little bit below the speed limit, and observe carefully how the lanes develop..
Usually, and I hope always, when there is a heavy traffic road, I expect the lane grouping to be clearly posted and with sufficient distance, but I have already turned right thinking that lane was for only that purpose, and when checking Google maps it was clear that lane was for both, for going straight and turning right. It is a bit of common sense really, there was not signs on the top of the road, (scary for the winter) and I swear the arrow painted on the road was faded and all I could see was the curvy arrow indicated right turn only.. Perhaps I am too sensitize from my past experience.